Warning: Image – heavy post. 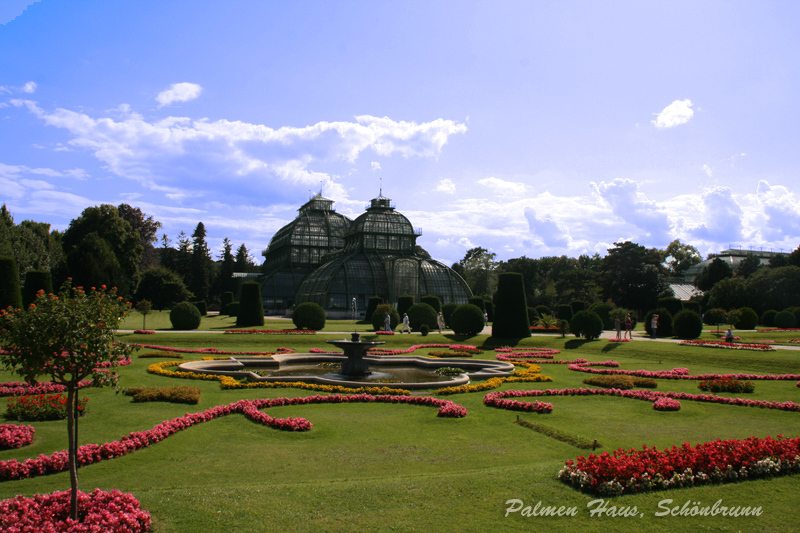 There’s not a year that passes by that we do not visit the Schloss Schönbrunn (Schönbrunn Palace). We used to live near the area so it’s inevitable but even though we’ve moved and it takes about an hour to travel there, we still do come by, even when it’s in winter, in spring, in summer and especially during fall. So let’s start with the entrance. Below photo would show you the scale of the palace’s grandeur size compared to a bus and some cars. 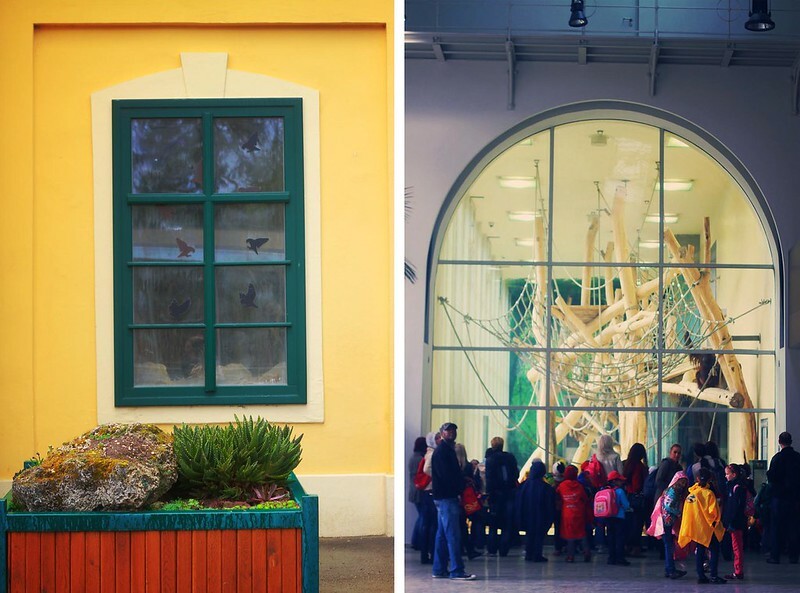 There’s no entrance fee when entering the palace grounds which makes it a favorite tourist attraction…well, not just that…the Schönbrunn itself is a UNESCO Heritage Site and is so full of history worth learning about. The tours and the museums, and zoo are not free though. 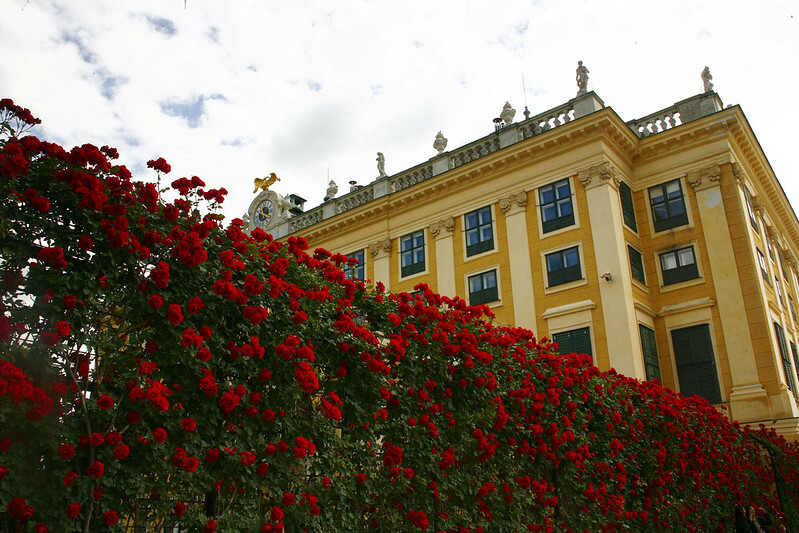 This link provides information of Schönbrunn palace tickets for those attractions. 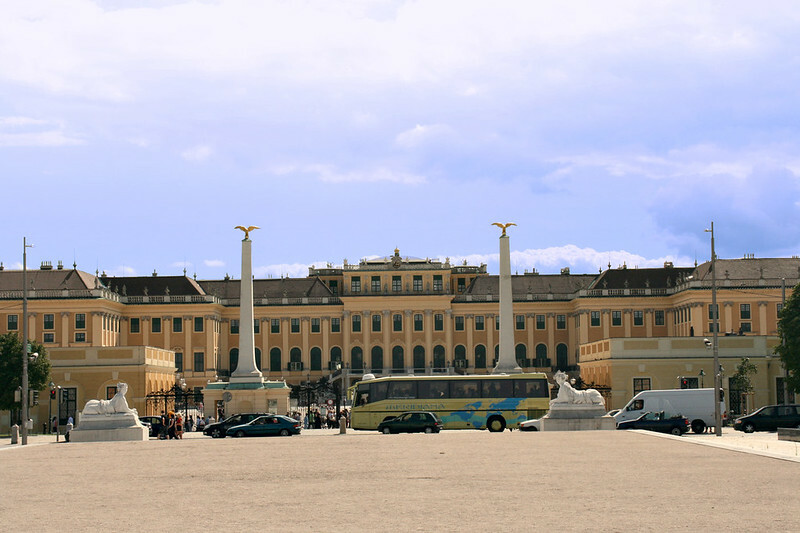 Two obelisks stand on each side of the Schönbrunn Palace’s gate. 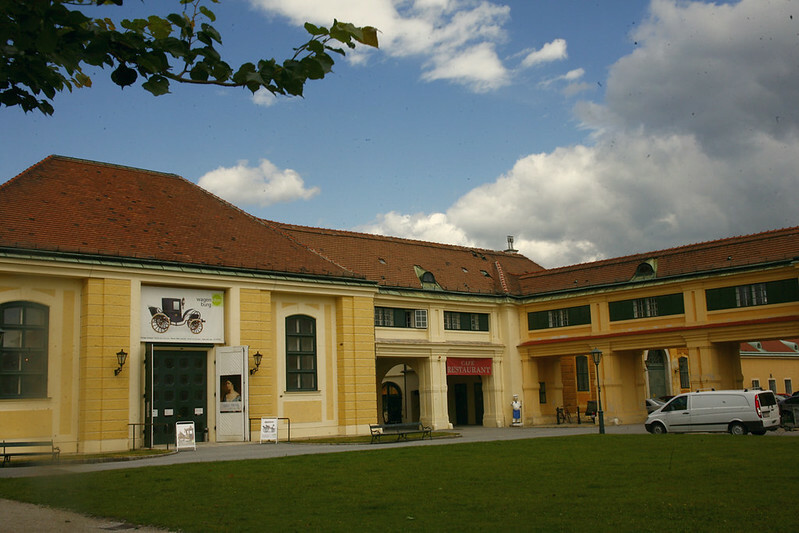 Buy your Schönbrunn palace tickets here. 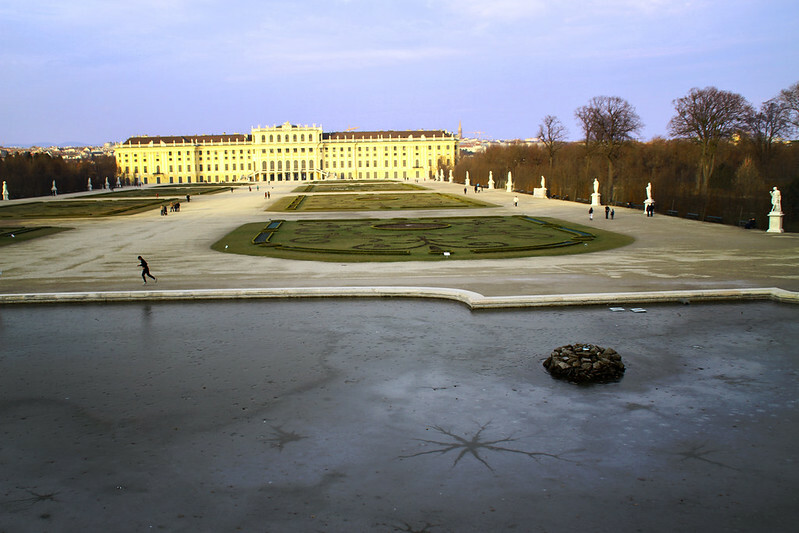 The vast courtyard of the Schönbrunn Palace houses a theater, a cafe, fountains with a cobblestone path leading to the palace’s front balcony. The balcony leads to the ballroom, which unfortunately, I could not show for prohibition of taking photos inside the palace. 🙂 The Schönbrunn palace has 1,441 rooms…but it was not so in the beginning. To answer the question “why are there so many rooms,” well every emperor would add a room or two during their reign. Sometimes they add an extension to the palace that it grew bigger and bigger to its size today. The palace was originally a mansion called Katterburg. 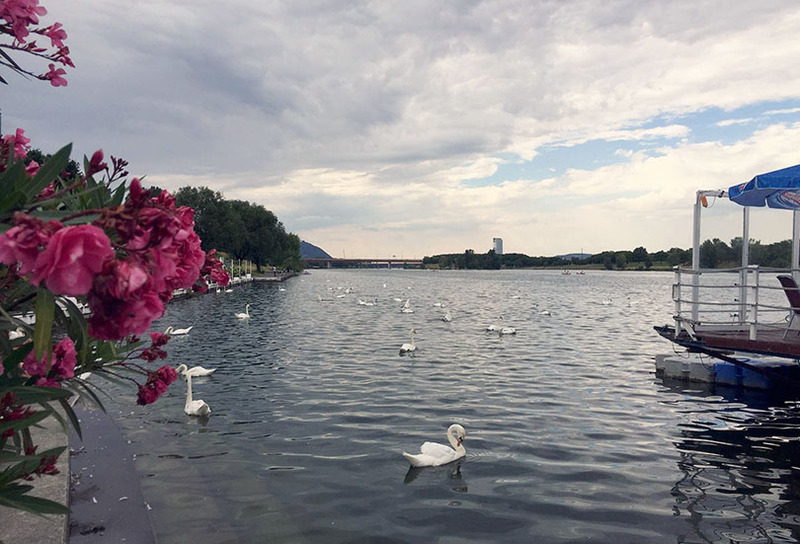 It was bought by Roman Emperor Maximilian II along with the floodplain it was erected on. He intended the place to be the court’s recreational hunting ground. He got the area fenced and exotic animals were kept and fishponds were made. 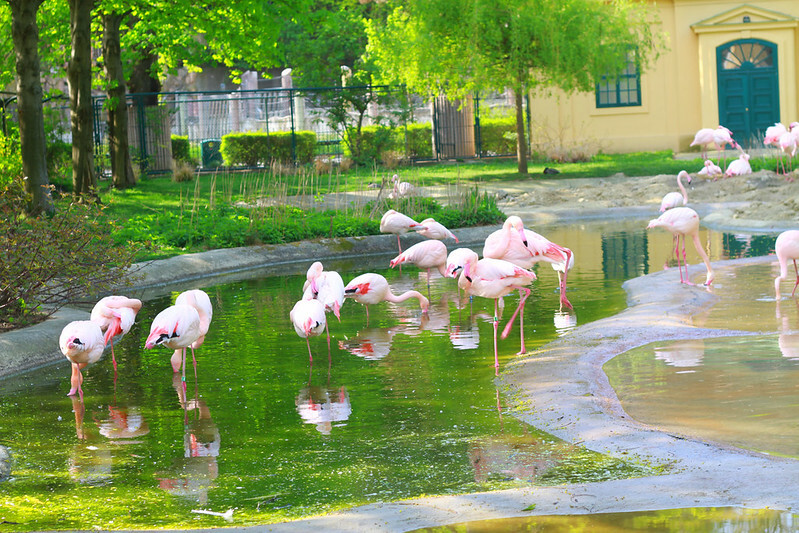 To this day, there is a zoo and an aquarium that visitors enjoy. The little kids especially like the maze. 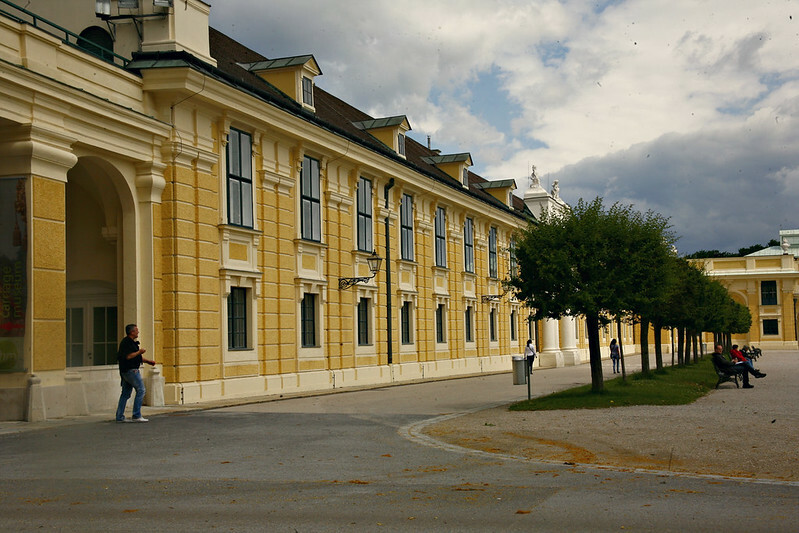 The palace served as the Summer residence of the Habsburg monarchs and the member of its House. The Habsburg Monarchy (or the Habsburg Empire) covered the territories ruled by the junior Austrian branch of the House of Habsburg (1278–1780), and then by the successor House of Habsburg-Lorraine (from 1780), between 1526 and 1867/1918. The Imperial capital was Vienna, except from 1583 to 1611, when it was moved to Prague. From 1804 to 1867 the Habsburgs ruled the Austrian Empire and from 1867 to 1918 Austria-Hungary. 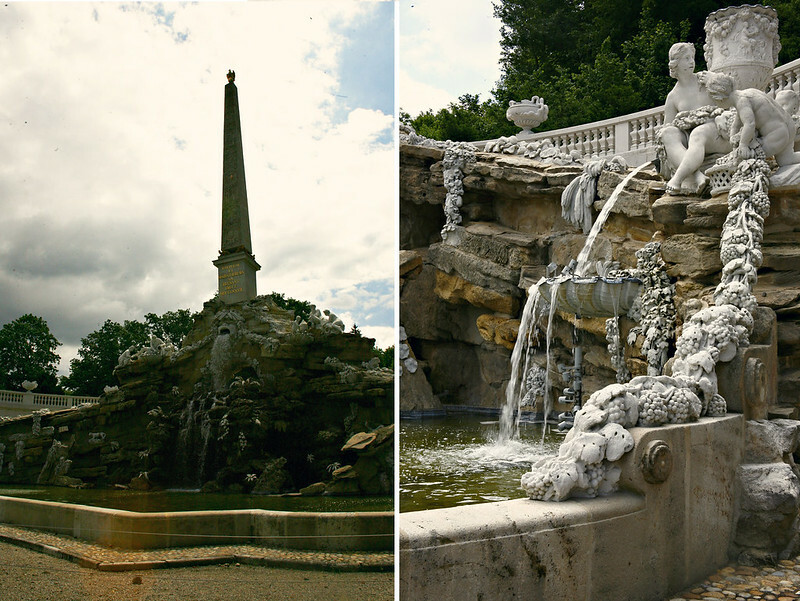 The name Schönbrunn literally means “beautiful (schön) well (Brunnen).” It comes from the artesian well from which healthy water was consumed by the court. 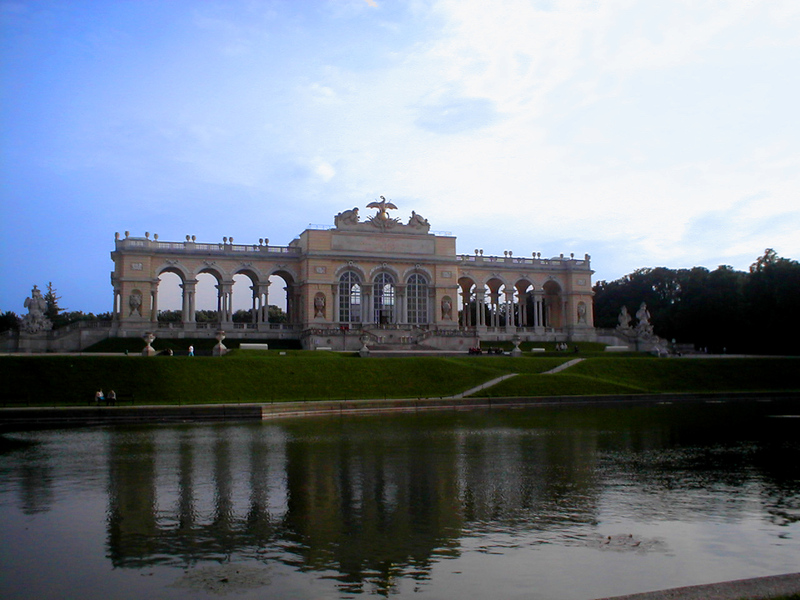 Thus, Schönbrunn Palace is derived literally from: “beautiful well”. Facing the palace going to the left, one would find the well after walking a path of trees. It was unfortunately under maintenance the last time we went and I never got the chance to photograph it the other times we’ve visited. Walking further, one would find the Roman Ruins. They are follies that look naturally integrated into the surrounding area. A picturesque horticultural feature added as an attraction. It was erected in 1778, in tune with the era’s rise of the Romantic movement. Further to the left one will find the Obelisk Fountain. It is erected at the foot of the Hill leading to another structure, the Gloriette. 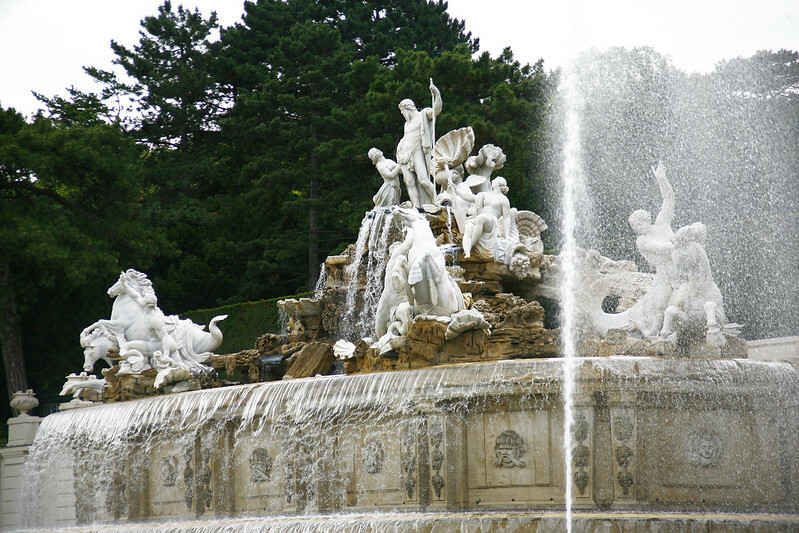 Like the other features at the Schönbrunn Palace’s ground, this fountain was also designed by Johann Ferdinand Hetzendorf von Hohenberg. According to the inscription on the socle of the obelisk was erected in 1777. The fountain has a pool contained against the slope behind it by a retaining wall reamed by a balustrade and decorated with vases. Projecting forward into the basin from the centre of the back wall is a grotto with river gods, crowned by an obelisk. Water flows out of the mouth of a central mask and also the vases held by the river gods into basins and finally into the main pool. The obelisk, a symbol of stability and permanence. Details of the fountain by the obelisk. the coach used by Empress Elisabeth (Sissi) when she first arrived in Vienna in 1854 prior to her marriage to the Emperor. The same carriage was used by Napoleon when crowned King of Italy in 1805! Hopefully we’d be able to enter the museum next time as it was closed when we last visited. For now I am borrowing this photo. Note the man on the right to scale. Notice too the horses, which are Lippizan, are of a taller breed. These horses were developed with the support of the Habsburgs. Going a bit to the side of the palace, one would be welcomed by garden of roses in different colors, a pathway resembling a tunnel under vines growing on an iron structure. This is majestic when the flowers are in full bloom as lavender flowers hang down. There are also mini-ponds full of lilies in different colors but this is just to prepare visitors to what would be a grander view. 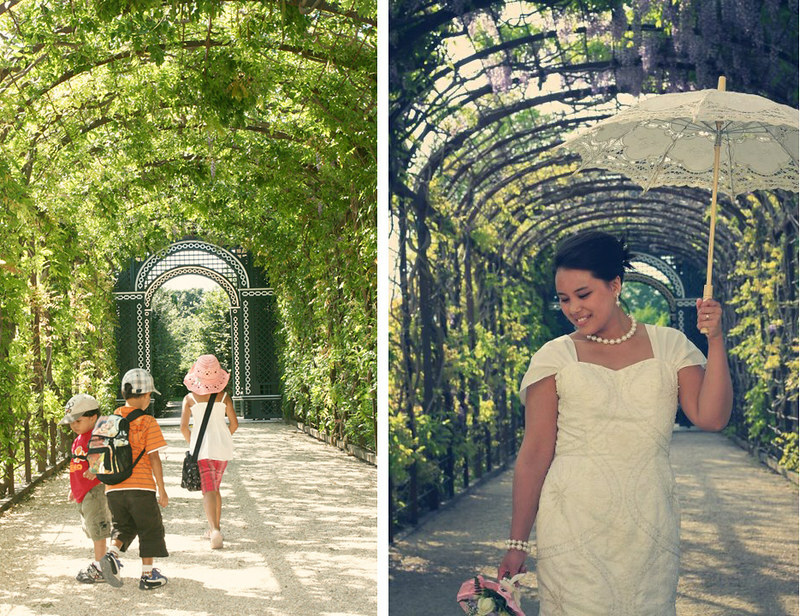 A garden path under vines…my kids walking aimlessly and a friend, whom I got the privilege to be the photographer when she got married. A wall of roses by the palace’s side wing. 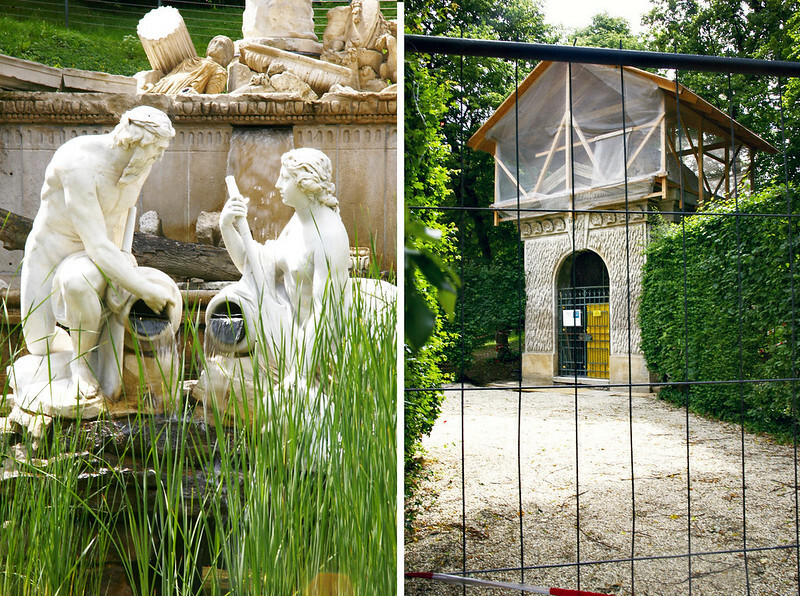 Behind the back of the Schönbrunn Palace is a vast garden designed and taken care of by Vienna’s Unsere Garten, the department responsible for landscaping and beautifying the city. Noticeable would be the white and red flowers by the side, a representation of the Austrian flag. Note that the flowerbeds are asymmetrical. This entire area is called the Great Parterre, there are 32 sculptures by the side representing deities and virtues (I’ve yet to look for my photos of those). 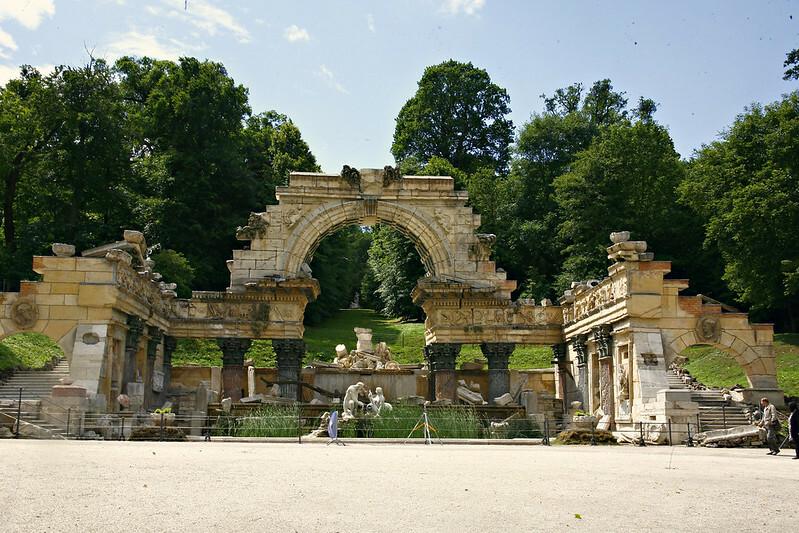 From this part of the garden, one can view the Neptune fountain, a massive structure representing Neptune and his minions. Above the hill, the Gloriette is also visible. I have climbed this hill a number of times and I won’t tire for the view from up their is so worth looking at and taking photos of. 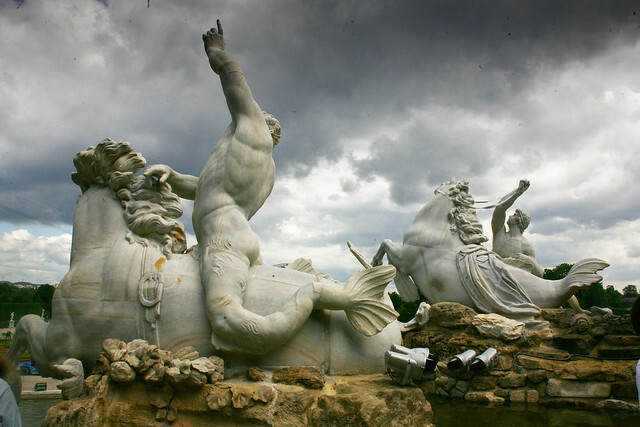 The Neptune fountain is consisted of Neptune, the god of the sea on a shell-shaped chariot, Thetis; the sea goddess kneels by his side to entreat the former to protect her son, Achilles. There’s also a nymph on the other side and tritons (merman) holding their special attributes, conch shells are seen restraining the sea horses. The back of the structure is actually a curious piece. 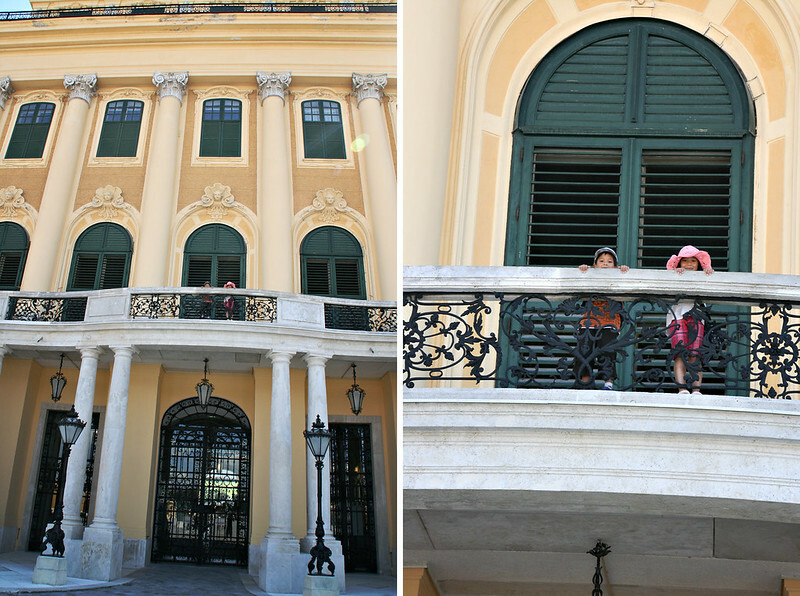 One can go about to examine the structure itself while others just take photos of the palace’s back view. Going up the hill from the Neptune fountain is a struggle as the pathway zigzags…it’s the best choice for someone trying to lose weight! ^_^ There are also pathways on the side leading up, if you’re not up for the challenge, the Liliputbahn will take you up the hill to the Gloriette. The Gloriette, French for little glory, is a pavillion erected in 1775. It is the last building constructed in the garden according to the plans of architect Johann Ferdinand Hetzendorf von Hohenberg as a “temple of renown” to serve as both a focal point and a lookout point for the garden, it was used as a dining hall and festival hall as well as a breakfast room for emperor Franz Joseph I. That hall now houses a cafe. There’s a platform on top of the Gloriette that one can access with a fee….the staircase leading to it is a bit steep but it’s worth going up to view Vienna from atop. I hope to show more of the Schönbrunn in the next posts. Here are some more photos I took through the years and will feature them one by one soon. Back of the Palace, Great Parterre in winter. Frozen pond, view from the Neptune Fountain. 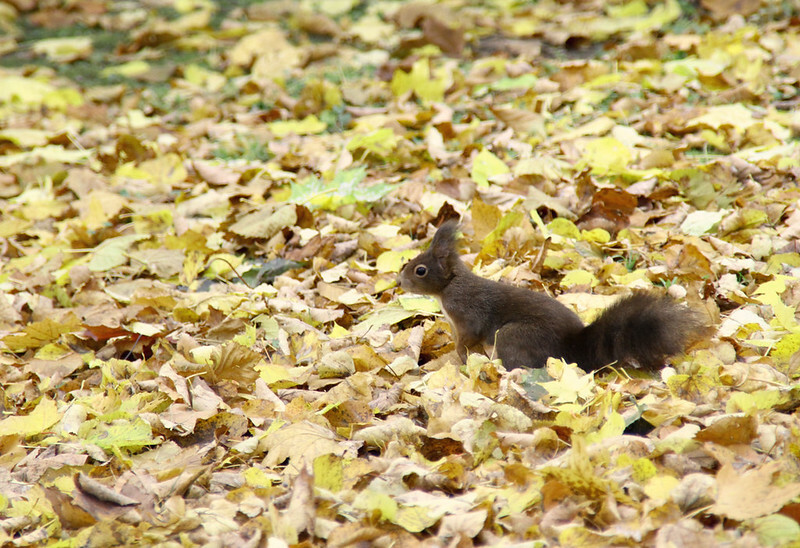 Squirrel looking for nuts to prepare for winter. Windows at the Aviary and inside the monkey house. This is exactly what I miss from Europe. We moved from the UK to the US four years ago and I miss our road trips around Europe visiting beautiful places like this! The gardens look magical and as an Architect I just adore exploring old buildings. And vast is the right word… you could spend days here!! I remember friends who are also architects came by, in my head I was like: please don’t go pointing to me which is baroque, gothic, romanesque and so on…haha, they did! Told them about my thoughts later and they were laughing…I can only imagine how awesome it is for you! Wow, that looks gorgeous. 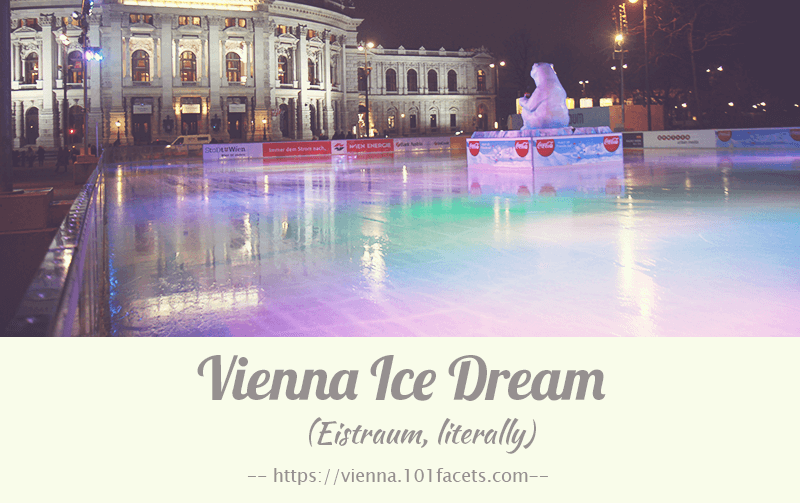 I’ve never been to Vienna (or Austria itself, for that matter) but if I ever do, I’ll need to add this to my list. The only palace I have been to that would compare would probably be Versailles, in Paris … but this looks much bigger than that. Wow, that looks gorgeous! I’ve never been to Vienna (or Austria itself, for that matter) but if I ever do, I’ll need to add this to my list. The only palace I have been to that would compare would probably be Versailles, in Paris … but this looks much bigger than that. The palace of Versailles is truly charming. 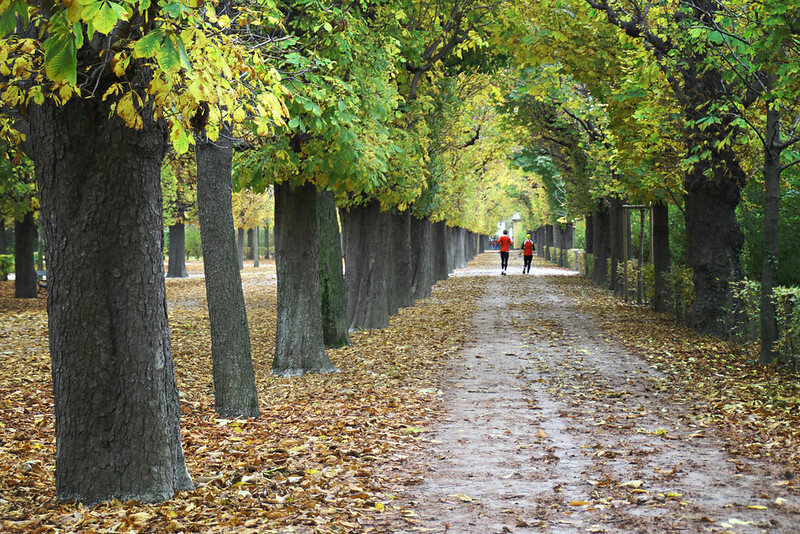 Yes, I hope you find yourself walking on Schönbrunn grounds soon. Thanks! It must be amazing to live near such a beautiful palace. Love that you embrace the treasures in your backyard. It amazes me how many neighborhood treasures we have nearby – no palaces, yet amazing nonetheless. Absolutely gorgeous pics. I am always in complete awe of palaces! We do not have anything like them in the states! However, my favorite parts are tree-lined roads and courtyards! Do come by for a visit…the states has a lot of beautiful buildings to boast too…all with its architectural value and uniqueness…thanks for dropping by! This is a place I want to add to my bucket list. I want to start planning a trip here with the family. Your pictures are amazing an inviting to visit. I love all the green and the gardens. Now to make it happen. The vined walkway and the Palm House are my favorites! It is amazing the number and quality of historical buildings to someone from a place like America. I used to think old houses were anything near one hundred years. But to understand that a structure reaches back through centuries and is as beautiful today as when it was constructed is incredible. I would love to visit this in Vienna in person, but thank you for sharing these in the meantime. What an absolutely stunning place! I love the Neptune’s fountain! It’s beautiful! I love this post. This is actually potentially in the works this summer here for me – I will be in the area for a conferences actually and I am looking at ways to see more and prioritizing. The fountain is stunning in this post. You have convinced me I think that Vienna needs to be high on my list. Wow there really is a lot of beauty there and so much to see. My daughter loves the idea of visiting there someday but I am not a fan of flying so far away. If I could snap my fingers and be there right now after seeing those photos, I would for sure! Looks absolutely amazing. I would love to spend a day there just exploring and learning. Not to mention the amazing photo ops too! Thank you for sharing your experience. I hope to visit one day. Omgoodness what a beautiful place to vist and man do they have a lot if rooms. 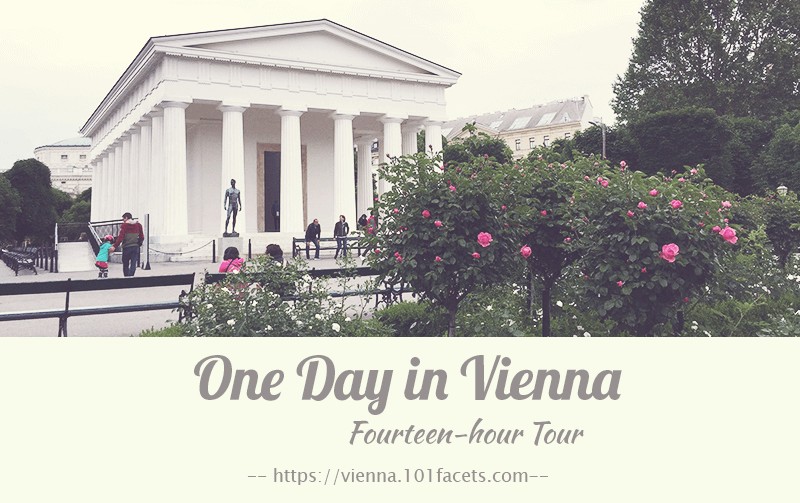 Vienna would definitely be on my travel wishlist! The fountains are so unique!